These are made from sawn slabs of stone which then has one side sand blasted before being cropped to size. Exclusively sourced from a ethically run Portuguese quarry. We ship across the whole of the UK and can offer expert advice on all aspects of pavement laying and construction. Whether you need them for kerbing, a pavement or a driveway these setts are the best available. 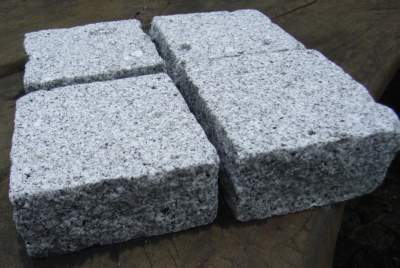 These setts can vary in colour as they are natural products quarried from slightly different stone each time, as such no guarantees on an exact colour match can be given. In particular, the gold and brown type can vary the most as it is a weathered granite. Next you will need to decide what size setts you want by choosing from the options at the top of this page, then enter your desired area in square metres (if you would like to order by weight or count you can change your unit). Click 'check availability' and you will receive a real-time quote offering a price. If you are happy with the offer you can continue to checkout where you be required to enter your delivery information and payment details. We will get back to you within 24 hours with a confirmation of delivery. Other finishes available, these are made to order so please allow 3 - 4 weeks for delivery.